With a natural range extending from Queensland to Tasmania, Damperia stricta is a varied species grown fore the attractive flowers. Flowering for up to 8 months from autumn right through to summer, this is a suckering perennial that can reach around .5 metres in height. Being long flowering Damperia stricta makes a good addition to a native garden, rock garden or the general garden border. It can also be grown in containers if desired. The named variety ‘Glasshouse Glory’ is one of the more popular Damperia varieties. Plant in a well drained soil in a sunny position to light shade. 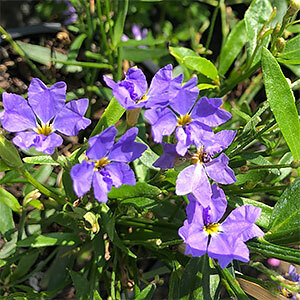 Common Name – Blue Dampiera. Soil – Well drained with some moisture. Flowers – Blue to mauve. Flowering time – Autumn to summer with spring being peak flowering period.